Hi, I needed a decent DAC, (bluray Cambridge Audio CXU) and also a good ADC, so, it was a straightforward decision. I cannot speak yet regarding the ADC capabilities, I'll update later, but here it is the detail about the DAC, which turned out to be great. I feed it through USB (Allo USBbridge with Volumio) and toslink for the CXU CDs. The XLR outputs are connected to an Emotiva XSP-1 preamp, whose amplification is done by an Emotiva XPA-5 Gen3. The speakers are a Dali Opticon 6. From the beginning the clarity and detail of highs/mids was clearly noticed (by everyone at home). Re-listening the Eric Clapton Unplugged album was marvellous, the strings sounded bold and cristaline, you could see the fingers snapping them. The bass was fine as well, very controlled. The sound was all perfect, but, there was still more. 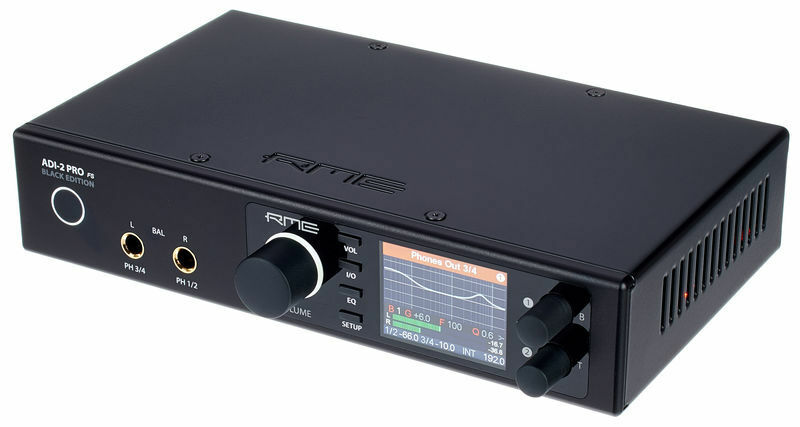 I've never done any EQ, and to be honest, was not much interested, but this has been an astounding discovery with the RME, now I can't think of having a DAC with no EQ possibilities, what a difference! Regarding the bass, i.e. I compared it with the Emotiva XSP-1 crossover, being the RME clear winner, you have infinite ways to tweak it. Also the mids/highs can be incredibly improved. Of course this is personal, as this opinion is, obviously, but I really liked all that stuff, stuff that I was reluctant to use before. Now I can't think of getting a DAC without EQ. Respect the headphone output, it is absolutely stunning, the "Loudness" management it provides makes a huge difference. The headphones are a B&W P7. The only bad points would be, to say something, first, it does not offer a remote, although since I go through the XSP-1 not much problem here, and second, the documentation, despite of being huge, sometimes does not seem very well organized. The configuration possibilities are amazing, still tweaking , learning and improving, what a great piece of gear! BTW, It swallowed everything I threw at it (up to DSD 128, I don't have higher rates). I'll be back when using the ADC, but first I need to upgrade the turntable. Some words for the Thomann personnel : chapó! excellent service & attention, congratulations! Total black is cooler than front white. Maybe it is the same inside with the anniversary edition except the transparent top window. And the upgrade for steadyclock FS, the femtosecond oscillator, brings a more clear sound image than the non-FS edition. It has reached all my needs. But one thing. If only it is equipped with a physical AES/EBU XLR jack. ID: 448555 © 1996–2019 Thomann GmbH Thomann loves you, because you rock!